space for 18 of your pure essential oils and two further slots for larger 50ml size bottles and space for other aromatherapy items, smaller items and supplies. and aromatherapy supplies safe whether you are on the move or in the salon. will allow your essential oils to be organised for every time you use them. Suppliying you with the perfect storage solution, this owl essential oils case is complete with the quality and finish you would expect. Made from top quality durable materials, is ideal as a gift or to treat someone special in your life. Why not add some oils and give it as a gift. 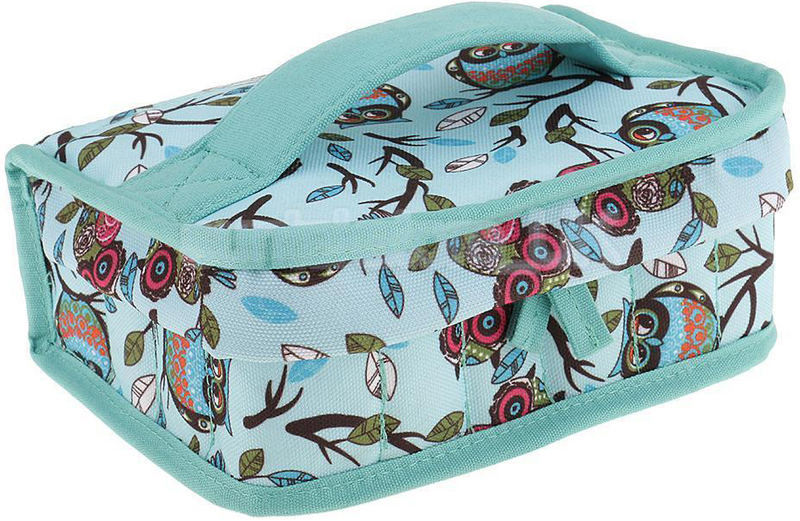  Compact and lightweight, this essential oil case is very easily stored away.  Will fit smaller and larger bottles from 5ml, 10ml and 15ml, including 50ml bottles like a base carrier oil, and other items.  Small handle on exterior for easy travelling when on the move, or at home for easy carrying. If this bag isn't what you are looking for we have a whole selection of aromatherapy wooden boxes and case storage solutions in our range.